Is this the Rebbe from Boropark? One son is the Aleksander Rebbe, another son is the Aleksander R”Y. It’s a very popular yeshiva, attended by a mix of bochurim from all the branches of chassidus. He was the son-in-law of the previous Alexander Rebbe, but declared his “Rabistiva” only late in life, a few years before his death. The other Rebbe in EY was less closely related. His sons are the ones that built up the empire. 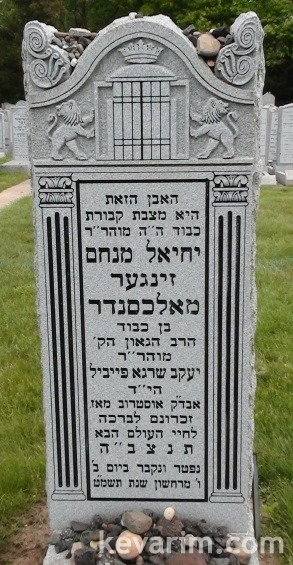 How was Rebbe Shraga Feivel Sholom Dembinsky related to the Aleksander Admorim? He was the son in law of the Tiferes Shmuel, the 3rd Aleksander rebbe. He was approached after the churban to become the Rebbe. At the time he was a business man in America. He denied to be rebbe saying that Aleksander was wiped out. Later Yehuda Moshe Tyberg in Eretz Yisroel was approached. He was the son in law of Betzalel Yair Danziger in Lodz, the brother of the Tiferes Shmuel. He was learning in Yerushalayim, and he accepted to be Rebbe. he and His son, the previous Aleksander rebbe in Bnei Brak, rebuilt Aleksander in Israel and across the world since the holocaust. 20 years ago, R’ Yechiel Menachem Zinger became rebbe shortly before he died, at the pressure of his son, the current Boro Parker Aleksander rebbe. The Current Aleksander rebbe of BoroPark is a big baal Tzdaka and has a Yeshiva on 45th and 10th upstairs from Satmar. he has only a few actual chassidim compaired to the Danzigers in Israel, who have their own shteible on 15th and 19th. Who is the aleksander rebbe in Cleveland? i think his name is not zinger. Rabbi Danziger brought life into Cleveland! Never saw a place of Chesed like the Rebbes house!!! he had a house of torah veavodah!! i used to eat in his succah every year together with another 40-50 people!!!!!!!!!!!!!!!! i wish the rebbe lots of success in cleveland. aiwa. I will never forget the last Simchas Torah the rebbe was in belgium! the Rebbes son Yehiel, made very leibidik, everyone danced for at least 4 hours! thats something i really miss! The cleveland community got a real excellent present! I heared from a relyable source that the rebbe finished shas when he was 11 years old. I have never met a gaon like the alexander rebbe of cleveland, I never knew that america produces gedolim like the rebbe. I used to learn at the Rebbes Kollel in Belgium and i could say without a doubt that the Rebbe knows Shas inside out! if anyone could help find a copy of emunas moshe, (an alexander sefer) that would be great!